Discover the easy as anything wearability of our pull on boots, an eclectic range of designs that will add a practical but seriously stylish edge to your ensembles. With designs ranging from short ankle length to knee high and everything in between, there is sure to be an easy to wear boot style for you. They have one thing in common - they are superbly easy to manoeuvre on and off with their easy to pull on and kick off design, providing a quick and oh so simple solution to your everyday wear. Constructed in the same elite way as all of our other exceptional boots, our pull on styles radiate luxury and premium craftsmanship - creating a sophisticated look that fuses convenience with style and substance. In versatile designs that will mix and match with all of your day to evening attire, this bevy of boots boasts luxurious textiles and trend-led silhouettes with dynamic detailing for the ultimate wear. 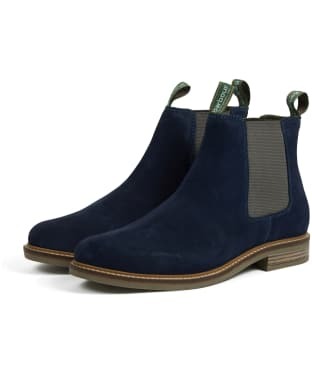 The Barbour Bedlington Chelsea Boots are a pair of smart, stylish men's Chelsea boots with a leather outer and Barbour's signature Classic Tartan lining for that classic country look. Finished with a branded rivet and branded outsole, the Barbour Bedlington boots are ideal for day or night. 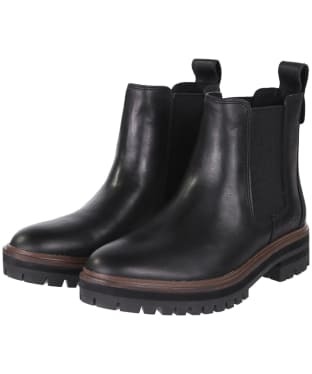 A wardrobe essential for any stylish lady, the Women's Barbour Rimini Chelsea Boots are sure to keep your feet protected from the elements whilst offering a stylish feel that you are sure to love. Part of the Barbour Weather Comfort collection, these boots boast hydrophobic leathers that will repel any water, with the seam seal taping and water resistant linings offering the upmost protection on those rainy days. Whether you are out exploring the country or taking a walk into town, these boots are sure to keep you comfortable, with the rubber commando sole ensuring that you stay safe and secure even on those slippery terrains. Beautifully crafted from the highest quality leather, these timeless Chelsea Boots feature elasticated side panels for ease of movement, as well as pull tabs to make putting on and taking off the boots simple! We love the practical yet super on-trend feel of the Rimini's; with the diamond quilted leather and tartan detailing reflecting Barbour's classic design for an iconic feel. 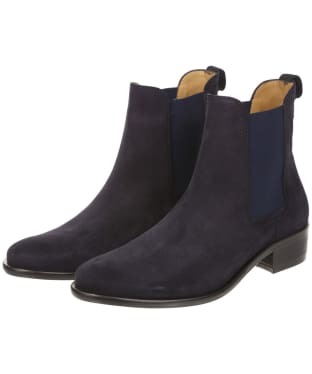 Step out in style with the Women's Joules Westbourne Premium Leather Chelsea Boots. These stunning boots have been hand crafted from 100% leather for not only a premium feel, but to also offer optimum durability and comfort, helping you to walk through the town or country with ease. To keep you cosy, the boots feature a full leather lining, adding to the luxury feel of the Westbourne's, which we are sure that you will love. 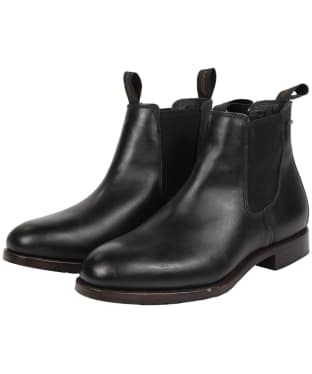 For ease when putting on and taking off the boots, there are leather pull tabs to the back, along with an elasticated side panel, adding to the timeless feel of these classic Chelsea style boots. Perfect for pairing with your favourite Joules jeans, sweater and coat, the Westbourne's are a fabulous finishing touch to your on-trend look. The Men's R.M. 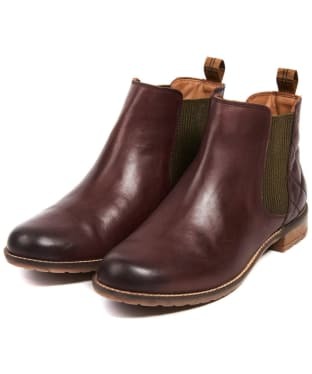 Williams Comfort Craftsman Boots have been hand crafted from a single piece of leather in Australia and boast R.M. William's striking construction and design. With just a single seam at the back, the boots have been goodyear welted which gives you long lasting quality you can rely on. These hardwearing boots are stylish and practical enough to wear in the countryside or in the town with friends and feature elasticated side panels to provide freedom of movement and all day comfort. Both stylish and practical, the boots feature a treaded rubber sole and a solid rubber heel, offering the upmost comfort and cushioning to your feet. The branded pull tabs add that final stamp of style and quality, whilst also allowing the boots to be removed and put on with ease. With striking detailing, outstanding construction and eye catching style, these boots are sure to be your go to footwear for many seasons to come and can be paired with your favourite jeans or trousers and a shirt for a stylish on trend look from head to toe. 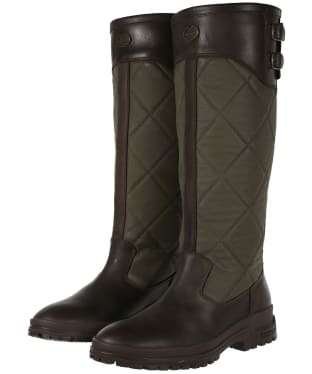 Stylish yet high performing, the Women's Le Chameau Jameson Quilted Boots are the ideal footwear solution for the lady who loves the outdoors. These stylish and practical boots have been crafted from premium nubuck leather in a quilted design, which not only looks great but also offers superb comfort and protection. Combining heritage and style with the latest technologies, the boots feature Le Cheameau's LCX® lining which makes these boots completely waterproof, and keeping your feet warm, dry and comfortable in conditions up to -5°c. Lightweight and featuring an adjustable strap to the calf to get that perfect fit, these boots will look great paired with your jeans and jacket to achieve that timeless country look which is sure to turn heads. For when tricky terrains need to be negotiated, the boots boast an impressive Michelin Deep Forest Sole, which absorbs shock and offers you complete comfort and grip no matter what conditions you are facing. A stylish alternative to your wellingtons without compromising on performance, you are sure to love the comfort and look of these boots and they will be a wardrobe mainstay for many seasons to come. 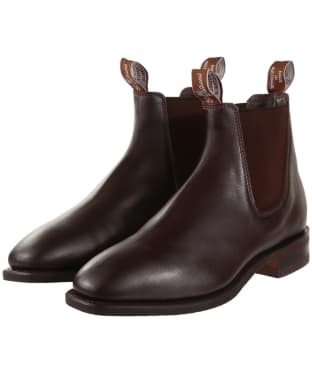 The Men's Dubarry Fermanagh Chelsea Boots combine classic styling with expert craftsmanship to give you a luxury piece of footwear that is built to last. The boots have been built from Dubarry's DryFast-DrySoft™ water resistant leathers, ensuring your feet stay dry and comfortable wherever you may be heading this season. A full leather lining, insock and insole gives you excellent comfort all day long whether heading into the office or into town with friends. Like all Dubarry products, the Fermanagh boots boast outstanding attention to detail and feature a stylish brogue inspired design that runs throughout the boots and simply looks great. Built to last the boots feature Goodyear welted sole construction with a durable rubber outsole, ensuring these will be a wardrobe staple for many a season to come. For the wearers convenience the boots also feature elasticated side gussets and branded pull tabs which not only adds to the style but also allows for EasyOn-EasyOff™ fit. Wherever you are heading this season the Men's Dubarry Fermanagh Chelsea Boots can be worn for both casual and formal occasions, and will work perfectly with a Dubarry tweed jacket or shirt for a look that never goes out of fashion. Step out in style this season with the Men's R.M. Williams Chinchilla Boots. A highlight of the R.M. Williams collection, these boots have been hand finished from a stunning natural tone leather, to give them that premium look and feel which complements your outfit perfectly. The Chinchilla Boots boast that classic R.M. 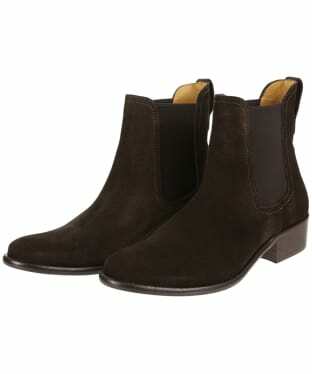 Williams look and combine style and practicality perfectly to build a boot that will last season after season. Finished with a chisel toe for an elegant and stylish look the boots feature full kid lining and a leather sole and insole for a comfortable and cushioning feel whilst you are out and about. The signature branded pull tabs have also been added which makes fit and removable easy and also adds that final stamp of quality and authenticity. Whether heading into the office or out into town or country with friends, the Men's R.M. Williams Chinchilla Boots will look super stylish and can be paired with your favourite jeans or trousers to complete your look for many seasons to come. Combining modern and Western inspired styling, the Women's Fairfax & Favor Rockingham Boots have been designed with the classic Cowboy boot in mind, to offer you a stunning boot ideal for keeping you on-trend whether you are heading into the town or country! 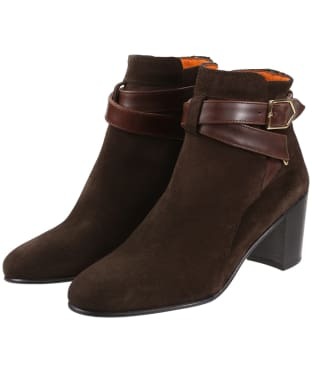 These mid-calf length boots have been crafted from the highest quality suede, and are lined with leather for a premium feel that you are sure to love. Featuring decorative hand stitching to add to that classic yet iconic look, the Rockingham offer a bespoke feel, with the two pull tabs to the top of the boots helping you to put on and take off the boots with ease. No matter where you are walking, these boots have been designed to offer the upmost comfort, with a memory foam insole as well as a composite leather and rubber outsole that will support your feet all day long. Perfect for any occasion, the Rockingham have a subtle Cuban heel, making them ideal for pairing with your favourite shirt and jean ensemble, or a cute dress and boot look. Finished with subtle Fairfax & Favor branding for that added mark of excellence, the boots have a zip fasten to the side to offer that perfect fit. The Fairfax & Favor Kensington Boots are a fashion-forward pair of ankle boots, complete with belt detail and signature branding. 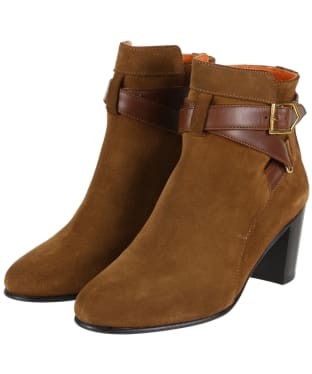 Ideal for the busy woman about town, these 100% suede boots feature a smooth leather belt detailing and a neat round toe for a beautiful soft finish. Perfectly bridging the gap between smart and casual, these Fairfax & Favor leather lined boots also feature a 7cm block heel for a little elevation and a giving a feminine edge to your look. They also feature a combination leather/rubber sole for added grip. 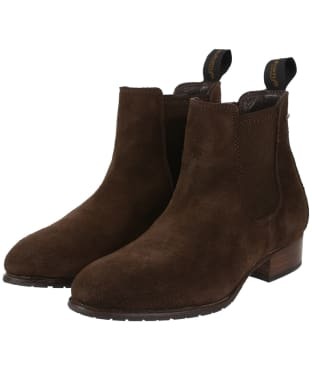 Feedback has suggested that these boots have a narrower fit, you may consider choosing the size up from your regular shoe size if you have a slightly wider foot. 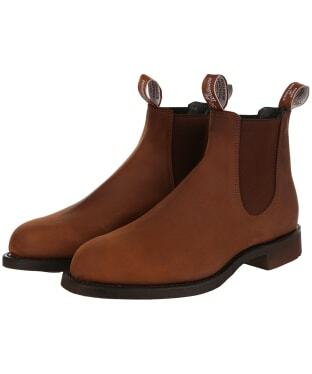 Following the traditional style, the Fairfax and Favor Chelsea boot offers a timeless classic item. 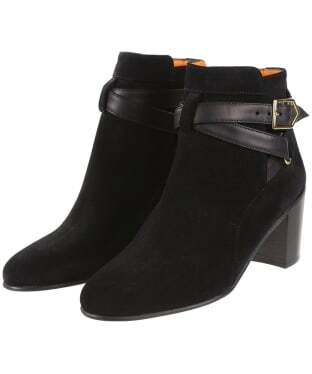 The addition of a block heel creates a luxurious feminine boot that is sure to compliment any outfit choice. Crafted from the highest quality suede, the Chelsea offers complete comfort, whilst boasting an iconic and fashion forward boot that any stylish lady will love. Ideal for long days, the boots feature two elasticated panels to the side, along with a pull tab to the spine of the boot, ensuring that you can remove them with ease. 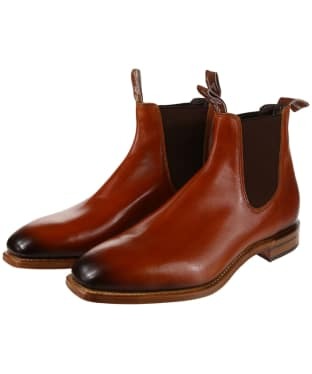 The Chelsea boot is beautifully finished with the signature Fairfax and Favor shield, adding a touch of luxury styling. Perfect for trekking or hiking in your favourite rural area, the Le Chameau Jameson Boots are a pair of high performing unisex footwear you are sure to love! Combining style and heritage with the latest technologies, the boot is crafted from environmentally friendly premium leather which offers optimum comfort and protection all day long. The boots also utilise Le Chameau's LCX® lining which uses 5 layer construction to prevent any water permeating the boots whilst simultaneously allowing vapour to escape easy, guaranteeing your feet to stay warm, dry and comfortable up to -5°c. Lightweight and featuring an adjustable strap to get that perfect fit, the boots also boast Michelin's Deep Forest Sole which besides being hard wearing and shock absorbing, offers you comfort and grip even when tackling the most demanding of terrains. Easy to put on and remove, these boots are suitable for all day wear and offer a stylish alternative to your wellies but without a compromise on performance, allowing you to continue your adventures whatever the weather. 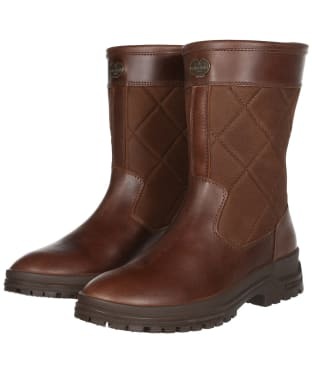 The Women's Dubarry Roscommon Leather Boots are high quality leather ankle boots made from Dubarry's water resistant DryFast-DrySoft™ breathable leather. 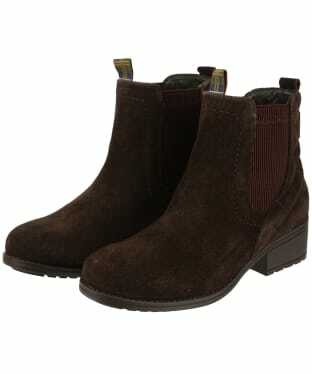 Versatile and easy to wear, these beautiful boots are an all-year round 24 cm high boot with GORE-TEX® liner. They also have duo compound PU and rubber sole directly injected onto the upper. There's a handy finger pull fitted inside of the boot for ease of entry. 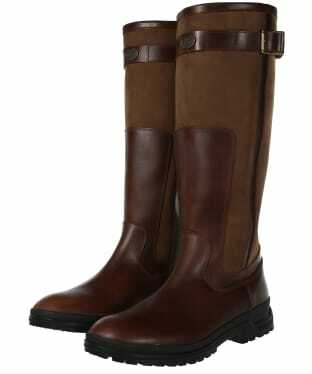 With subtle, signature branding for both Dubarry and GORE-TEX®, these are the perfect accompaniment to any outfit. For more information on how to properly care for your Dubarry boots, please refer to our Dubarry leather boot care guide. 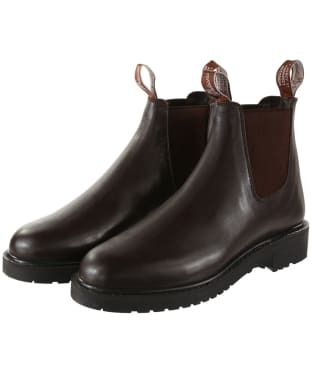 Men's Barbour Farsley Chelsea Boot. A plain toe Chelsea boot with branded Barbour fabric pull loops. Dark green soft leather linings with a classic tartan padded footbed. Finished off with a metal antiqued badge. Please note that these nubuck boots do not have a polished appearance as some images may suggest. They have a more grained, rugged look. The Men's R.M. 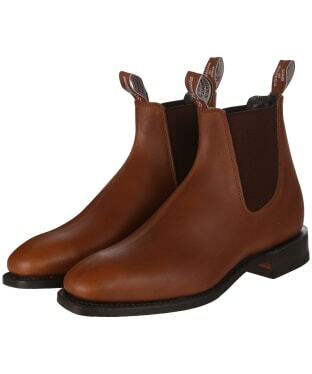 Williams Gardener Boots have been hand crafted from a single piece of leather in Australia and boast R.M. 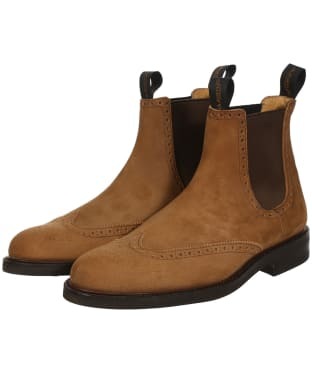 William's striking construction and design, with just a single seam at the back, the boots have been Goodyear welted which gives you long lasting quality you can rely on. These sturdy and hard wearing boots transcend both smart and casual, and can be worn in the countryside or in the town with friends, boasting a smart stylish look you are sure to love. The branded pull tabs add both style and a seal of quality and also allow the boots to be put on and removed with ease. Boasting a treaded rubber sole and a solid rubber heel, the Gardener's offer you outstanding comfort and cushioning to your feet. With striking detailing, outstanding construction and eye catching style, these boots are sure to be your go to footwear for many seasons to come and can be paired with your favourite jeans or trousers and a shirt for a stylish on trend look from head to toe. Designed with style and practicality in mind, the Women's Ariat Wexford Waterproof Boots are sure to be an essential addition to any lady's wardrobe. Whether you are heading out into the country or popping into town, these boots are sure to be your perfect partner come rain or shine. Crafted from the highest quality full-grain leather for that luxurious feel, the Wexford Boots boast Ariat's top of the line Waterproof Pro™ membrane construction that creates a durable barrier between you and any liquid to prevent your feet getting wet should the rain start to fall! Providing long lasting protection from the elements, these on-trend Chelsea style boots are sure to be your perfect partner for everyday wear no matter what the weather brings. Sleek and simple, the Wexford boots have been designed to offer the upmost comfort, featuring ATS® technology for stability, whilst containing a gel cushioned footbed with a heel stabiliser for shock absorption and to provide lasting support helping you to walk further for longer. A moisture wicking layer adds to the super comfortable feel of the Wexford Boots that are finished with a non-marking outsole for maximum wear resistance. These stunning boots are sure to complete your attire with ease. 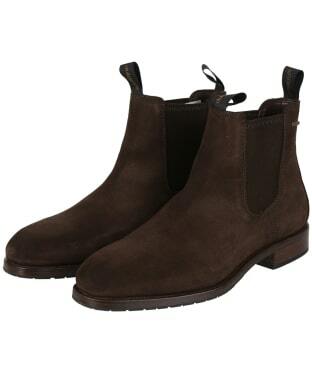 Step out in style this season with the Men's Barbour Farsley Chelsea Suede Boots. Crafted from a leather and cotton blend in a suede effect, the boots boast a classic tartan lining and memory foam, giving you premium comfort that gets better over time. Finished off with branded pull tabs for easy fit and removable the boots also boast the Barbour metal badge to the rear and the walking man motif to the outsole to complete a stylish boot that will keep you on trend and turn heads all season long. A wardrobe essential for any stylish lady, the Women's Barbour Maggie Chelsea Boots are sure to complete your on-trend look with ease. 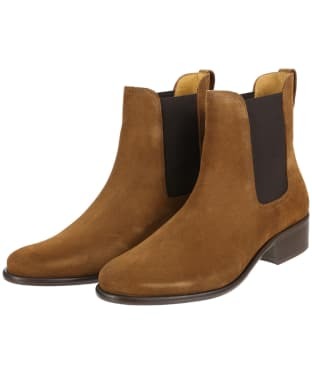 Crafted from suede for a premium feel, these boots boast a concealed gusset, to offer an updated take on the iconic Chelsea boot design, as well as ease movement and comfort. 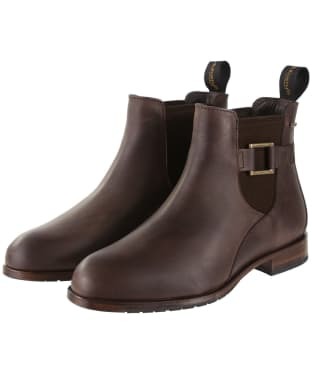 The men's Dubarry Kerry Leather Boots feature a classic Chelsea boot design, and are perfect for anytime of the year. The Kerry boots have classic styling such as the elasticated side gussets, with heel finger pulls, to make it quick and easy fitting the boots. 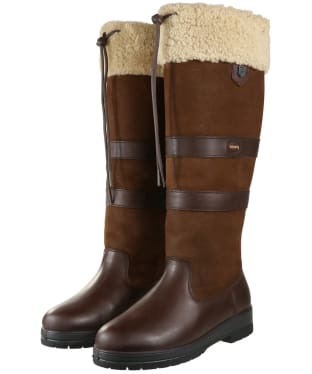 Also featuring Dubarry's own DryFast-DrySoft ™ leather outer, giving the high quality leather a water resistant coating, which is backed up by the GORE-TEX® liner which adds even more waterproofing, as well as making the boots breathable, keeping you comfortable even in the worst weather. 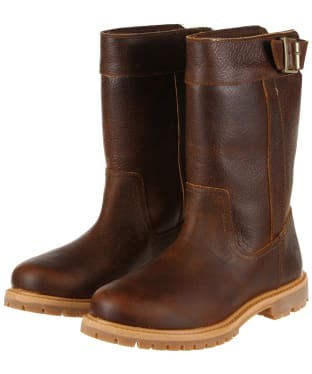 The sole is hand built by Dubarry, and is crafted using high quality leather and rubber for a long lasting finish. The insole is made up of three layers, one of which is a thermal foil lining, this protects your feet from the cold, keeping them warm and dry, even in the middle of winter. As well as the foil layer, Dubarry have built in even more comfort with a cushion filler built in between the outsole and lining, making these the go-to shoes for any time of year. For more information on how to properly care for your Dubarry boots, please refer to our Dubarry leather boot care guide. A new addition to the Le Chameau collection, the Women's Jameson Mid Leather Boots have been designed with style and practicality in mind, to bring you a pair of boots that are perfect whether you are out exploring the countryside or simply heading into town. These mid-height boots have been crafted from premium Terracare® leather, as well as oiled nubuck to the upper of the boots for a premium, high quality feel that you are sure to love. Boasting a leather lining for added warmth, the Jameson boots also have a waterproof and breathable 5 layer LCX® lining construction that will prevent water from entering the boots, whilst allowing vapour to escape easily, keeping your feet dryer for longer. These lightweight boots feature a removable, stiffened memory foam moulded insole that not only supports feet, but offers the utmost comfort, helping you walk further for longer. Set on an exclusive Michelin C compound sole, you can be sure that these boots will keep your feet secure even on slippery, uneven terrains, whilst still maintaining a comfortable feel. The quilted design offers an iconic, timeless feel, ensuring that these boots will keep you looking on-trend through this season and beyond. The Jameson's are finished with signature Le Chameau branding for that premium, high quality feel. 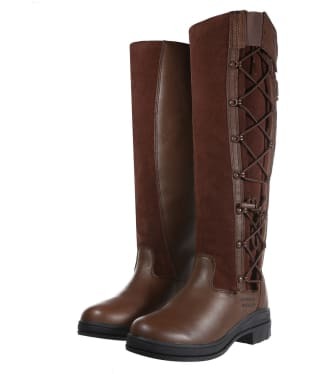 The Women's Ariat Grasmere H2o Waterproof Boots are an essential addition to any stylish lady's wardrobe. Perfect for whether you are out riding horses or simply strolling through the countryside, these leather Ariat boots have been crafted with ATS® technology to provide you with the utmost comfort and support for your feet, helping you to walk further for longer. The lining of the boots has been constructed with a Sympatex® waterproof membrane to keep feet dry, as well as with Thinsulate™ for a warm, cosy feel even on the chilliest of days. The specially designed riding outsole offers grip even on slippery terrains for added practicality. Sure to keep you looking on-trend through this season and beyond, these timeless Ariat boots boast a fashionable lace system and modern eyelets to the side, ensuring a flattering look and a tailored fit to the calf that can be adjusted to suit you. 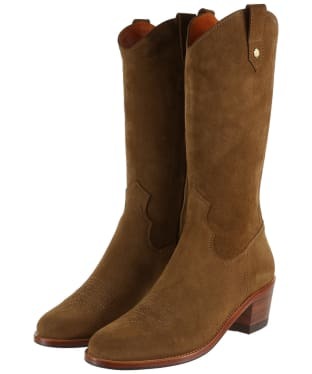 These stunning boots are finished with signature Ariat branding for a premium, high quality feel. The Dubarry Waterford Chelsea Boots are a great everyday boot with a new design sole unit and a stylish toe shape. This new sole unit is an injection moulded sole with a rubber outershell to offer fantastic shock absorbency and incredible support. The leather upper is finished with a water resistant finish that is also DryFast-DrySoft™ to ensure that your shoes look and feel great for seasons to come. 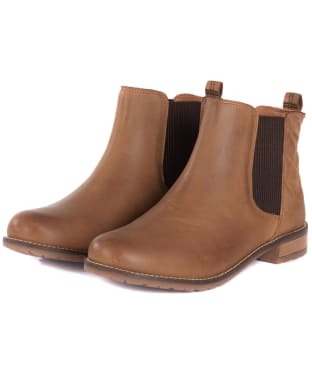 These Dubarry Chelsea boots are lined with waterproof and breathable GORE-TEX® membrane, which is ideal for country life and will ensure dry and warm feet whatever the weather. Both sides of the Waterford Boot feature elasticated side gussets to complete the traditional Chelsea style, as well as complement the heel finger pull for easy on/off fit. The Waterford Boots are finished with subtle Dubarry and GORE-TEX® branding. 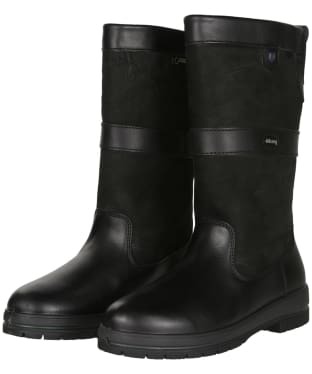 Add style and practicality to your wardrobe with the Men's Ariat Wexford H2o Waterproof Boots. Crafted from a Waterproof Pro™ construction with full-grain leather, the premium boots are sure to keep you feet dry whether you are out and about in the town or country. Sleek and simple, the Wexford boots have been designed to offer the upmost comfort, featuring ATS® technology for stability, whilst containing a gel cushioned footbed with a heel stabiliser for shock absorption and to provide lasting support helping you to walk further for longer. The non-marking rubber outsole will offer a stable feel on those unpredictable terrains, with the pull tabs to the back ensuring that you can put on and take off the boots with ease. Functional and stylish, these go-to country boots are an essential finishing touch to any gentleman's on-trend look. The Men's R.M. Williams Kangaroo Comfort Craftsman Boots are perfect for adding a touch of style to many of your favourite look this season and beyond. These iconic craftsman boots are beautifully constructed from one piece of kangaroo leather, offering you an added touch of luxury and style. Kangaroo leather is one of the strongest leathers for its weight in the world, meaning you will have a durable boot you are sure to love!For an added touch of stylish detailing this classic Chelsea boot design has been finished with a classic chisel square toe, perfectly completing the classic R.M. Williams look. Made in the R.M. 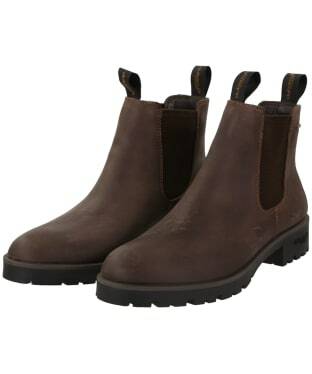 Williams factory in Adelaide these boots feature The Comfort Sole, which is perfect for everyday wear. The Comfort Technology features a fibreglass airport-friendly shank, which reinforces the shape of these boots and supports the arch of your foot. Light sole construction increases flexibility while retaining the durability of a composition sole. For the mark of R.M. Williams quality and style these boots have been finished with R.M. Williams branded pull tabs. The Dubarry Kildare Boots are a beautifully crafted and perfect all rounder boot whether you're trekking the country, or walking around the busy towns these boots will get you there in style and comfort. The Kildare boots are a calf-height, leather, and use GORE-TEX® to keep the boots waterproof, and in turn keeping your feet warm, dry and very comfortable. The top of the boot is stretch adjustable and has a wide entry, for an easy and quick fit for anyone. 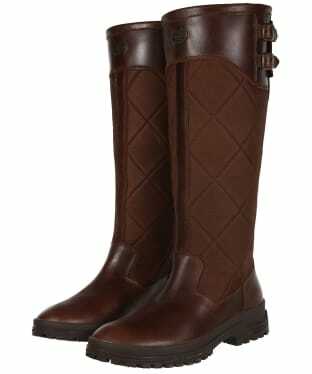 Worn with skinny jeans and an equestrian style gilet for the country look. For more information on how to properly care for your Dubarry boots, please refer to our Dubarry leather boot care guide. Add a touch of luxury to your look this season and beyond with the Men's R.M. 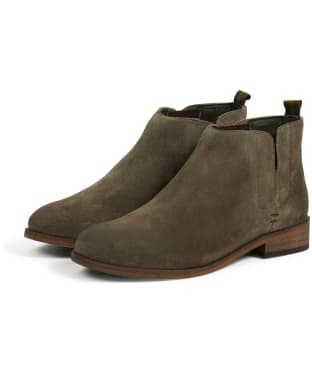 Williams Lachlan Boots, perfect for teaming with both jeans and chinos to complete your look with stylish ease. The Lachlan Boots have been crafted from a single piece of Vesta leather, which offers you a waterproof and heavyweight leather with a matt water repellent finish. These expertly crafted boots undergo over 70 handheld processes, with the unique, one piece leather design which ensure there is only one seam at the back of the boot. The Lachlan Boot has a Vesta leather upper, leather inner sole, and Goodyear welted, treaded composite rubber-sole. For an added touch of durability and strength the welt stitching uses hot wax dipped thread. The granulated corkalene filler offers you an increased cushioning between the insole and outer sole for added comfort. The R.M. 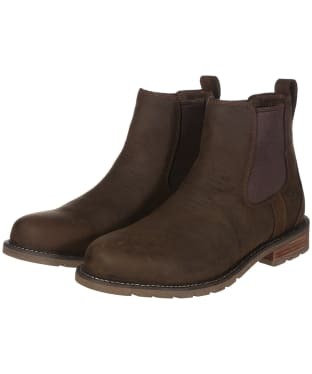 Williams Lachlan Boots offer you a truly elegant yet tough design. One of R.M. Williams's signature products, the men's R.M. 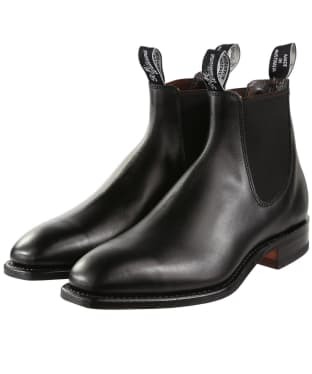 Williams Classic Craftsman Boots are a high quality and handmade version of the classic Chelsea boots. 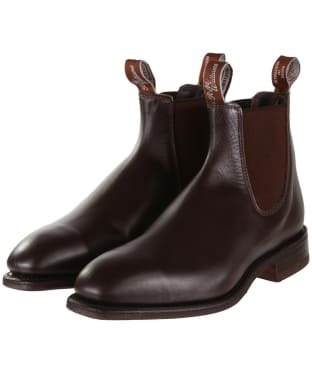 The boots are crafted from just one piece of the finest yearling leather, giving a seamless and smooth design all over the boots, as well as a quality and comfortable finish and fit. Keeping things classic, the boots have a square toe, as well as a flat heel, and feature sewn welt leather – sole construction. The tops of the boots have two branded tabs, making it easy to get in and out of the boots, as well as adding a signature finish. 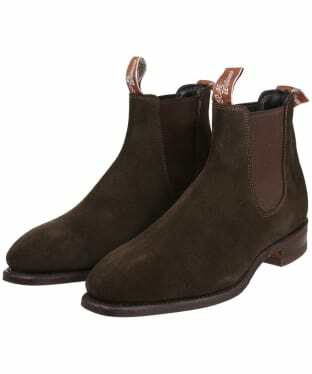 The Chelsea boot design is timeless and works with a wide variety of outfits and seasons, and the R.M. Williams boots are sure you keep you looking stylish for many years to come. Specially handcrafted in Adelaide - Australia, the men's R.M. 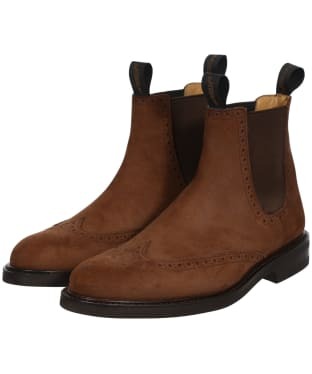 Williams Comfort Craftsman Boots exemplify the brand's impeccable craftsmanship and everlasting quality, dating back to the original construction of the first pair of boots in 1932 by Mr Williams himself. Executed in the finest, most supple of Yearling leathers with a superbly comfortable leather lining, the construction of these boots is a process that has been perfected over the years - hand-shaping a single piece of leather that presents a distinct upper ridge to the top of the boot offering unrivalled fit and comfort; now a signature mark of this style which fades over time with wear. The elasticated side panels aid the easy to wear slip-on design, enhanced by the branded embroidery pull tags to the front and back of the ankle - an iconic trademark of this high-quality brand. With a smooth, polished finish and a flat heel, the Comfort Craftsman Boot is a bold style statement that will soon become an indispensable part of your everyday wardrobe for casual or smart occasions. Finished with a specially shaped chisel toe and a longhorn non-slip rubber sole which offers outstanding grip, these boots are an elite choice for durable wear, infused with Australian outback charm in a sartorial aesthetic that's ideal for working outdoors or smart dress. 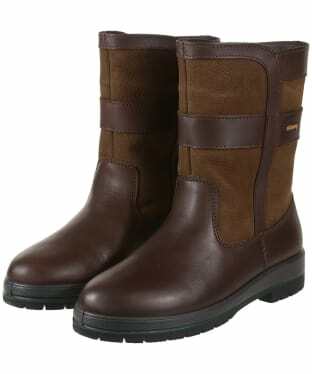 These robust and versatile calf-length Dubarry Meath Boots are ideal for the active outdoorsman. Both waterproof and breathable, these hardy Dubarry boots also feature a GORE-TEX lining for optimum temperature control. 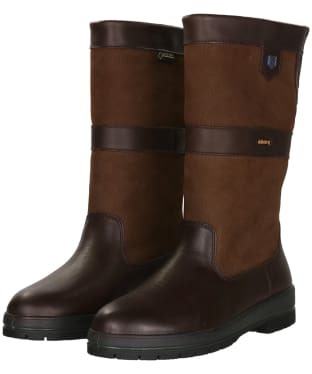 The GORE-TEX lining, combined with Dubarry's innovative Dry-Fast, Dry-Soft 100% leather upper, means not only will your feet be kept dry, but will be warm in the winter and cool in the summer: ideal for working outdoors. The sole of these Dubarry Meath boots provide unbeatable grip and support for rugged terrains, while the leather finger-pulls assists ease of foot entry. The signature Dubarry two-toned leather and subtle branding offer a brilliant finish and sit proudly as symbols of high quality and impeccable craftsmanship. For more information on how to properly care for your Dubarry boots, please refer to our Dubarry leather boot care guide. Ideal for work or casual wear, the R.M. Williams Stockyard Boots are crafted from a hard-wearing oxhide leather with double stitching for extra strength. Water resistant for added practicality, these R.M. Williams boots feature and extra wide round toe for added movement, with a breathable sole to ensure you are always kept comfortable while at work. Elasticated side panels allow for them to be easily pulled on or off, and fabric pull tabs reduce any stress on the back of the boot. A dual density rubber sole is great on slippy surfaces and offers expert mud release. 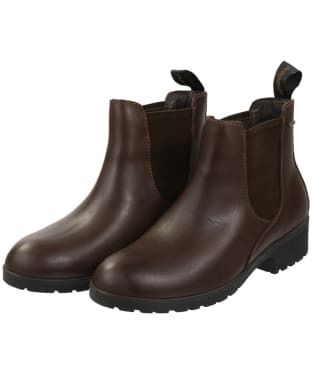 The Dubarry Antrim Chelsea Boot is a robust, full leather Chelsea boot with a hardy sole and elasticated side gusset. The direct injected sole consists of PU filler for underfoot comfort and shock absorbency and a moulded bi-colour rubber outer shell for durability. A deep cleated sole ensures mud and water dispersal, while the water resistant finish to the leather will keep them in top condition for years to come. Lined with a waterproof and breathable GORE-TEX® membrane, the Antrim Boots are ideal for keeping your feet warm, dry and comfortable on even the stormiest of days. 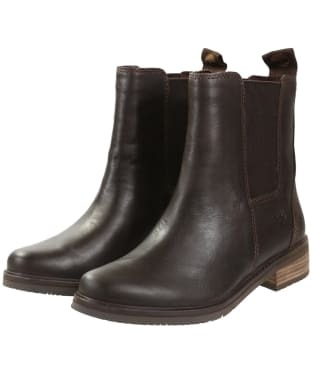 These Dubarry ankle boots include two fabric pull tabs to the front and back to allow you to easily pull your boots on. 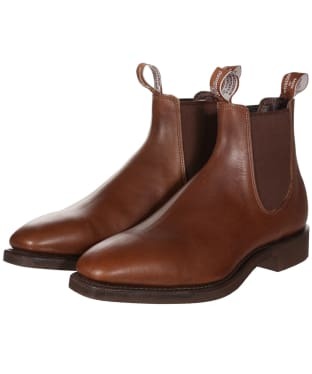 Perfect for town or country, the Dubarry Monaghan Chelsea Boots are crafted from premium leather and finish at the ankle for a versatile look that you can easily wear whatever the weather. 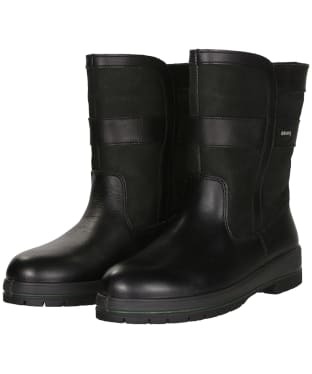 Complete with a waterproof and breathable GORE-TEX® membrane, these practical yet stylish boots are ideal for rain or shine, and can be worn all day thanks to the cushioned insole and hand built combination rubber and leather sole unit. The Monaghan boots feature a pull tab to the back of the boot for easy entry, with elasticated side panels for further comfort. 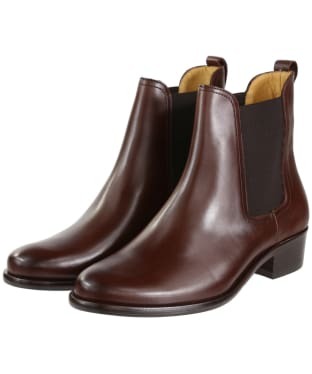 These classic Chelsea boots are finished with an on-trend buckle detail and Dubarry branding for a premium finish. The women's Dubarry Cork Boots are a classic Chelsea boot design, complete with Dubarry's attention to detail and quality craftsmanship. The Cork boots are waterproof thanks to their GORE-TEX®, which also helps to make them breathable, with a helping hand from Dubarry's DryFast-DrySoft™ water resistant leather outer, which adds even more water resistance as well as a high quality leather look. 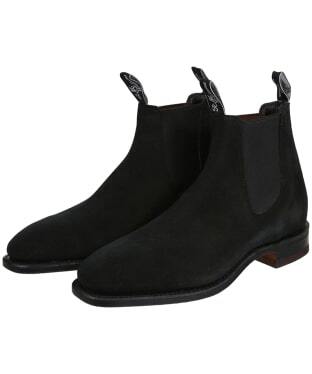 The sides feature the classic Chelsea boot elasticated gussets, finished with the heel finger pulls which makes for easy and quick fitting. The sole of the Cork is hand built by Dubarry from rubber and leather and features an underfoot cushion filler, placed between the lining and the outsole to provide excellent underfoot comfort, so you can carry on wearing the Cork boots for years to come. The boots also have some subtle Dubarry branding on the sole unit, in addition to the back of the boots for some added detailing. The classic design of the Cork boots mean they are versatile and can be worn with a wide variety of outfits, anything from some simple jeans with a knitted sweater, to a fitting finish to your favourite country outfit. For more information on how to properly care for your Dubarry boots, please refer to our Dubarry leather boot care guide. 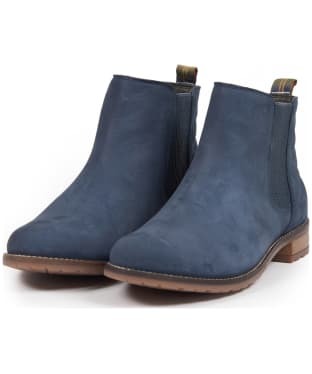 A timeless style sure to keep you on-trend through this season and beyond, the Women's Fairfax & Favor Chelsea Boots are an essential addition to any stylish lady's wardrobe. Hand crafted from the highest quality leather, we know that you will love the luxurious feel that these boots offer. 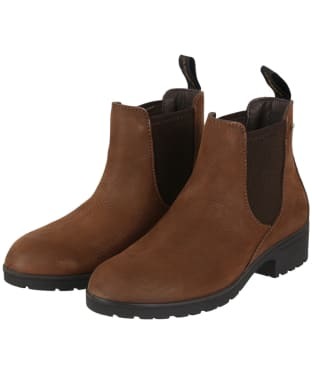 Practically designed, the boots are sure to be your perfect partner for everyday wear, whether you are heading into the town or country, featuring a comfort padded insole, an elegant rounded toe and shallow heel, making them not only exceptionally comfortable to wear, but also an on-trend finish to your look. The elasticated side panels and pull tabs ensure that taking off and putting on the boots can be done with ease. A classic design sure to see you through this season and beyond, this stunning piece of Fairfax & Favor footwear are finished with signature shield logo branding for that chic, fashion forward finish. The iconic style that is loved the world over, these R.M. 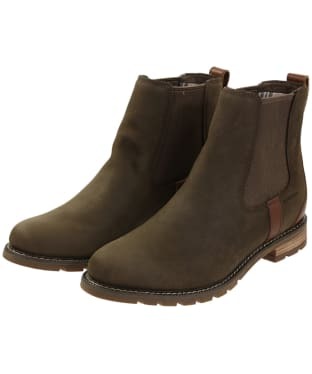 Williams Craftsman Boots are crafted from a single piece of premium suede leather in Australia, with expert attention to detail and comfortable rubber sole, these luxurious dress boots feature elasticated side panels for comfort and ease of movement, and woven cotton pull tabs. A neat square toe offers a stylish, smart finish, while the tonal upper stitching keeps the look sleek and timeless. The Craftsman boots have been made by R.M. Williams since 1932 by hand and nothing has changed since, promoting high quality finishing and beautiful design that will keep you looking your best for many years to come. No gentleman's wardrobe should be complete without a pair of the R.M. Williams Dynamic Flex boots. Uniquely crafted from one piece of leather in R.M. Williams Adelaide factory, these stunningly constructed boots provide you with a highly durable item that is sure to compliment any outfit. Perfect for everyday wear, the Dynamic Flex has been created with the highest quality yearling leather, to provide the upmost comfort and added luxury feel. They are sure to become a wardrobe favourite, with the sole featuring both a supportive, removable innersole, as well as a flexible cellulose insole board, specifically designed to reduce foot fatigue from those busy days on the move. The classic chisel square toe and flat heel are sure to keep you on trend, and add to the premium design of these boots. An added feature for your comfort and convenience is the airport-friendly shank, which will also support the arch of your foot. Outstanding durability and flexibility are fantastic overall features of the boots, with the combination leather and rubber sole providing you with both. A beautiful finishing touch is the R.M. Williams pull tab, designed to give you the mark of R.M. Williams quality and style. The women's Dubarry Kilternan Country Boots are high performance, après-ski boots, as well a great fashion accessory this season. The Kilternan boots takes its design from the class Dubarry Galway boot, adding genuine shearling fleece cuffs for added comfort and warmth. Designed as an après-ski boot, the Kilternan features hidden design features to protect you even better from the cold. The inside is lined with a GORE-TEX® Partelana lining, which goes down to the ankle, retaining four times more heat than standard GORE-TEX®, as well as ensuring that any snow or ice doesn't enter the boot. The foot-bed is crafted from three layers, including one layer of thermal foil lining, helping to protect your feet from the cold surfaces and retaining more warmth within the boots. A DryFast–DrySoft™ leather outer layer makes the Kilternan boots breathable as well as waterproof, giving you great protection from the rain, snow and ice. For a winter boot to protect you from anything you take on the Kilternan boots are the perfect partner for a practical, high performance boot, as well as being stylish and elegant in their design. For more information on how to properly care for your Dubarry boots, please refer to our Dubarry leather boot care guide.